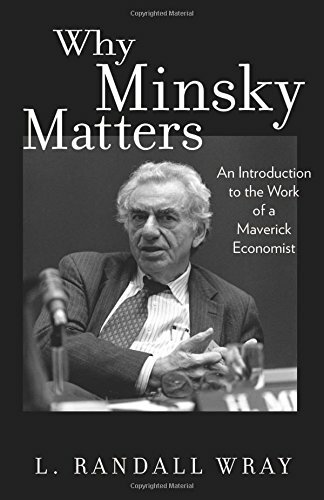 Nima discusses American economist Hyman Minsky’s ideas and contributions. Are we saying that Fannie and Freddie are the only root cause of the GLOBAL financial crisis? No, we’re not. And everyone who claims that that is the substance of our argument is a pathetic and petty little liar who has to make up ridiculous arguments on part of those he’s trying to oppose, because he’s incapable of dealing with their actual arguments … ugh! Author NimaPosted on December 17, 2010 December 17, 2010 Categories General EconomicsTags financial crisis, paul krugmanLeave a comment on Invincible Ignorance? I would like to take some time and outline the different angles from which, in my opinion, government policies in the United States have systematically created an environment that has made the occurrence of financial crises, such as the one of 2008, rather inevitable. In credit expansion policy I had already outlined the workings behind the then impending credit crunch. I have also talked about the other concepts you will read here many times before. But I never really took the time to package them all up in one article. But I do think that almost 2 years into a new administration that promised you “change”, it might be worth mulling over which of the root problems in the financial system they have actually, at least remotely, addressed. In 1913 Congress established the Federal Reserve System, a system of central banking, with the enactment of Federal Reserve Act. It granted 13 regional reserve banks, overseen by a central board in Washington, a monopoly over the issuance of the country’s fiat currency, the US Dollar, and tasked it with the oversight and regulation of all deposit banks (fractional reserve banks) in the country. The Great Depression of the 1930s was the first significant crisis that the US experienced as a result of the speculative excesses of the 1920s, a direct result of the newly established central banking system. A pivotal point in the history of money in the US, it enabled federal government bureaucrats and politically connected bankers to be in control of the issuance of money and credit, and transfer huge sums of wealth from the common man to the politically connected via a deliberate policy of credit expansion, a devaluation of the currency since its establishment of more than 95%, and constantly recurring business cycles of booms, busts, inflation, and deflation, which are at the root of all speculative bubbles, credit bubbles, and the ensuing financial crises. In particular, inquiring minds should take note of the fact that it was in mid 2000 that the Fed began purchasing mortgage backed securities for the first time. This is how the Fed did its small part in helping fuel the housing bubble that would lead up to the financial crisis of 2008. The government-sponsored enterprises (GSEs) are a group of financial services corporations created by the United States Congress. Their function is to enhance the flow of credit to targeted sectors of the economy and to make those segments of the capital market more efficient and transparent. The desired effect of the GSEs is to enhance the availability and reduce the cost of credit to the targeted borrowing sectors: agriculture, home finance and education. Congress created the first GSE in 1916 with the creation of the Farm Credit System; it initiated GSEs in the home finance segment of the economy with the creation of the Federal Home Loan Banks in 1932; and it targeted education when it chartered Sallie Mae in 1972 (although Congress allowed Sallie Mae to relinquish its government sponsorship and become a fully private institution via legislation in 1995). The residential mortgage borrowing segment is by far the largest of the borrowing segments in which the GSEs operate. GSEs hold or pool approximately $5 trillion worth of mortgages. Some of the GSEs (such as Fannie Mae and Freddie Mac until 2008) have been privately owned but publicly chartered; others, such as the Federal Home Loan Banks, are owned by the corporations that use their services. GSE securities carry no explicit government guarantee of creditworthiness, but lenders grant them favorable interest rates, and the buyers of their securities offer them high prices. This is partly due to an “implicit guarantee” that the government would not allow such important institutions to fail or default on debt. This perception has allowed Fannie Mae and Freddie Mac to save an estimated $2 billion per year in borrowing costs. This implicit guarantee was tested by the subprime mortgage crisis, which caused the U.S. government to bail out and put into conservatorship Fannie Mae and Freddie Mac in September, 2008. As Wikipedia outlines correctly, setting up these GSEs has done its part in fundamentally influencing the flow of credit into certain areas of the economy and thus, naturally, away from others. According to Fed data, the total mortgage volume in the US at this point is roughly $14 trillion, down from its peak (and the general peak of all credit in fact) in 2008 of $14.6 trillion, with GSE mortgages at $5 trillion out of that. This means that 36% of all mortgage debt is being held by GSEs, by institutions who are able to operate because of either an explicit or an implicit guarantee that the government will throw tax money at their management, were they to ever begin losing money. Is it surprising to anybody that such an arrangement would do a major part in encouraging over excessive mortgage credit lending, lead up to a housing bubble, and culminate in a default crisis sooner or later? Well, it is instructive indeed to study the history of these agencies before arriving at such conclusions. First of all, one simple question comes to mind: Why are there three big agencies that are in charge of pretty much all ratings? Why is there not more competitive pressure in the business of asset ratings? Surely if there was, the managers in charge would be a lot more careful. How has such a cartel been made possible? How come these agencies are STILL big in the business after failing to properly identify gigantic risks in countless asset classes, such as MBS? The rating agencies were originally research firms. They were paid by those looking to buy bonds or make loans to a company. If a rating company did poorly it lost business. If it did poorly too often it went out of business. Low and behold the SEC came along in 1975 and ruined a perfectly viable business construct by mandating that debt be rated by a Nationally Recognized Statistical Rating Organization (NRSRO). It originally named seven such rating companies but the number fluctuated between 5 and 7 over the years. 1) It made it extremely difficult to become “nationally recognized” as a rating agency when all debt had to be rated by someone who was already nationally recognized. 2) In effect it created a nice monopoly for those in the designated group. 3) It turned upside down the model of who had to pay. Previously debt buyers would go to the ratings companies to know what they were buying. The new model was issuers of debt had to pay to get it rated or they couldn’t sell it. Of course this led to shopping around to see who would give the debt the highest rating. With that I have to sit back and laugh at one of the original opening statements in this article: “I do not think that the market can discipline ratings agencies sufficiently,” said Mr Mindich, chief executive of Eton Park Capital and a former colleague of Hank Paulson, the Treasury secretary, at Goldman Sachs, the investment bank. Clearly Mr. Mindich does not understand the free market. The problems arose because the free market was disrupted by a misguided mandate by the SEC. Those interested in more information on this topic can read Removing a Regulatory Barrier by Senate Republican Jon Kyl or Creating a Competitive Rating Agency Sector by the American Enterprise Institute. Also note that the number of rating agencies is back up to 7 from 5 as of September 25 2007. See SEC Reanoints Rating Agencies. This is not particularly complicated to figure out: Government intervention, in this case via the SEC, created an environment where a few politically appointed agencies had the exclusive privilege to rate debt and where the company whose debt was rated had to pay the agency to perform a rating, rather than the investor or investor’s associations choosing freely whom they would like to see in charge of rating prospective investments. You may, at times, ask yourself a very simple question: Why do so many people care about the stock market? Why is there so much money sloshing around in it. There is a reason why there was so much money available to be invested in such securities, amongst others of course. Governments across the globe fundamentally encourage investing in the stock market in one way or another, be it mutual funds, government bonds, or outright securities.In the US this is done through retirement plans like 401k and ROTH IRAs. The concept is simple: Invest a portion of your money or else the tax collector will gladly take it away from you. This is how trillions of dollars are herded into the stock market, ready for mutual fund managers to be played with. One major player in the stock market is the government itself. Currently about $12 trillion is invested in government Treasury securities. To give you some perspective: As I outlined before, the total invested in US stocks is just about $10 trillion! Is it conceivable that such incentive policies might possibly have played some sort of role in the huge demand that was created for mortgage backed securities at one point or another? Could it be that, for the sake of propping up demand for government bonds among other things, government officials will always have some significant incentive to herd money into the stock market? Could it be that they will do everything they can on their end to ensure people will stay invested for as long as humanly possible? Is there really any point in getting upset at the financial corporations, waving your fists at them and getting annoyed at how powerful they are, when they are nothing but the inevitable outgrowth of this kind of government intervention and favoritism? And most importantly: Are you really an agent of change if all you can ask for is yet MORE government involvement, rules, and decrees as a solution? Are you not rather working into the hands of precisely those elites that have brought about this crisis? There are indeed things in this world that are complicated and difficult to figure out, no doubt. But this, I can assure you, is NOT one of them. The market is a system of elements that are in constant flux. In a free society where individuals are allowed to make choices by themselves so long as they don’t infringe upon their fellow men’s life, health, and property, entrepreneurs use natural resources, transform them and/or combine them with previously produced factors of production, and turn them into either consumer goods or other factors of production. They employ workers in the process who provide the production factor labor. They exchange consumer goods on the market against money obtained from consumers. They exchange factors of production against money obtained from other entrepreneurs. Those are the choices he has under a capitalistic system on a market where the consumer, the common man, is supreme, a market based upon voluntary action. Any of these steps would swiftly remedy the misallocation of the resources and align them to the benefit of the common people, the consumers. If an investor has invested in a company stock at a price that he deemed to be reflective of that company’s future earnings, but it turns out that consumers actually do not demand the company’s goods as expected, then the investor is punished via a drop in the stock price. This ensures that investors tend to try and invest in businesses which produce the most urgently demanded goods first, all ultimately in the service of the consumer. However, when a group of people within society obtains resources via the initiation of violence or the threat thereof, then we are leaving the realm of the market and of voluntary choice and we enter the realm of compulsory action, viz. the government. The government always and by definition manipulates the transfer of money in a way that is contrary to people’s voluntary value preferences. If it uses the money it has obtained in order to purchase stocks with the intent to support its price, it messes with the fundamentally most important indicator of a company’s performance in meeting consumer demands. It creates an environment of uncertainty and corruption, as investors will immediately flock toward this powerful group in order to ensure they get such special treatment. It prolongs the period during which a business engages in activities that it should and would have stopped engaging in much sooner, and thus always sets the stage for speculative booms and subsequent abrupt crashes in the future. The Working Group on Financial Markets (also, President’s Working Group on Financial Markets, the Working Group, and colloquially the Plunge Protection Team) was created by Executive Order 12631, signed on March 18, 1988 by United States President Ronald Reagan. The Group was established explicitly in response to events in the financial markets surrounding October 19, 1987 (“Black Monday“) to give recommendations for legislative and private sector solutions for “enhancing the integrity, efficiency, orderliness, and competitiveness of [United States] financial markets and maintaining investor confidence”. The Chairman of the Commodity Futures Trading Commission, or his designee. “Plunge Protection Team” was originally the headline for an article in The Washington Post on February 23, 1997, and has since become a colloquial term used by some mainstream publications to refer to the Working Group. Initially, the term was used to express the opinion that the Working Group was being used to prop up the markets during downturns. Financial writers for British newspapers The Observer and The Daily Telegraph, along with U.S. Congressman Ron Paul and writers Kevin Phillips (who claims “no personal firsthand knowledge” and is “not interested in becoming a conspiracy investigator”) and John Crudele, have charged the Working Group with going beyond their legal mandate. Claims about the Working Group, which are labeled conspiracy theories by some writers, generally include that it is an orchestrated mechanism that attempts to manipulate U.S. stock markets in the event of a market crash by using government funds to buy stocks, or other instruments such as stock index futures—acts which are forbidden by law. In August 2005, Sprott Asset Management released a report that argued that there is little doubt that the PPT intervened to protect the stock market. However, these articles usually refer to the Working Group using moral suasion to attempt to convince banks to buy stock index futures. I will not here try to figure out as to weather or not this PPT has actually intervened in the markets. There are so many other ways via which the government overtly interferes way out in the open that the accuracy of the above claims does not matter in the slightest to assess the validity of the theories I am presenting here. I will merely say that it is undeniable that plausible evidence exists to corroborate the idea that the government is using the PPT as yet another means to manipulate events on the market. Hmmm … does the financial crisis provide evidence that the concept of the corporation has made people engage in reckless behavior without bearing responsibility for the results of their actions? Haven’t we seen numerous articles about CEOs retiring with millions of dollars after wrecking their companies into oblivion? Haven’t we seen other CEOs pay themselves juicy bonuses after having been bailed out by the federal government? I don’t think anyone would seriously challenge this, but please let me know if you would like me to supply specific references and evidence and I will do so. We’re creating… an ownership society in this country, where more Americans than ever will be able to open up their door where they live and say, welcome to my house, welcome to my piece of property. – President George W. Bush, October 2004. The size and scope of the government’s intrusion into our lives has, at this point, grown to almost 40%, up from 7% in 1930. The number of pages in the Federal Register in 1936 was 2,620. By the year 2000 it was 83,294; a humble 3179% increase, or “deregulation” as some people seem to be referring to it these days. The Great Depression of the 1930s was a convenient excuse for the government to grab more power than it had ever dared to before. Now we are in that same situation again. The state will continue to do whatever it can to justify its growth. You, dear reader, might want to ask yourself a fundamental question if you haven’t already: How much more until we consider doing the opposite of what we have been doing? How much more of our liberties should we surrender in order to fix the problem? What have the thousands upon thousands of executive orders and acts of Congress given us other than digging us a deeper hole? How many times have you heard any government bureaucrat or mainstream media reporter seriously address the things that I listed above? Think about it. There are alternatives out there. I know they may sound new and alien to you. But is it maybe conceivable that we are right when we say that the initiation of violence solves no problems, but rather breeds more and more violence and with that more and more problems, chaos, arbitrariness, and confusion? We do indeed need more regulation and there is no better regulation than that of the market. Bureaucracy, government decrees, and aggression ironically always lead to absence of regulation while lulling the public in the delusion of more regulation. We need to put the guns DOWN! Childhood scar tissue makes it ferociously hard to accept this to so many people. But until that cycle is broken within our own lives by you and me and everyone else who cares, things won’t change. This post is just another attempt of many to encourage people to open their eyes and take an unbiased look around them. As logic and evidence permeate society, the mad fantasy that is the government will vanish. The more we see and understand how much damage it has done, is doing, and will continue to do, the sooner this will happen. And if you have made it until here without having fallen asleep, then I hope I have given you some valuable information to consider in your own quest for truth and knowledge.